The Regular Season in LUB is slowly approaching the end. But there may be still some important changes in the final standings in the last 3 rounds. Here is the last round review presented by ESL. The most interesting game was a derby match between two local teams from Montevideo: Malvin (#2) and Aguada (#5). Aguada was defeated at home 89-98 and even the fact of playing on their own court did not help. It ended at the same time the five-game winning streak of Aguada. Malvin shot 62.1 percent from the field. They shot the lights out from three sinking 13 long-distance shots on high 54.2 percentage. Malvin looked well-organized offensively handing out 27 assists. The best player for the winners was naturalized Brazilian center Hatila Passos (211-85, college: N.Mexico St.) who had a double-double by scoring 18 points and 10 rebounds (on 8-of-10 shooting from the field). point guard Marcos Cabot (178-89) chipped in 16 points and 6 assists. At the other side the best for losing team was American forward Dwayne Davis (196-89, college: S.Mississippi, agency: Interperformances) who recorded 30 points, 6 rebounds and 5 assists. Defending champion maintains second position with 17-6 record having just one victory less than leader Nacional. Aguada at the other side keeps the fifth place with eight games lost. Malvin's supporters look forward to another derby game next round, where their team will face at home their local rival from Montevideo Olimpia. Another interesting game was again a derby between two teams from Montevideo: Nacional (#1) and Olimpia (#4). Olimpia was defeated at home 82-92 and even the advantage of their own court did not help. It ended at the same time the three-game winning streak of Olimpia. It was a good game for naturalized Spanish center Esteban Batista (208-83, agency: Duran International) who led his team to a victory with 20 points and 9 rebounds. John DeGroat contributed with 21 points and 6 rebounds for the winners. American Brandon Nazione (202-94, college: E.Michigan) replied with 25 points and 7 rebounds for Olimpia. Nacional have a solid three-game winning streak. They maintain first position with 16-6 record, which they share with Urunday Univ. Olimpia at the other side keeps the fourth place with eight games lost. They share the position with Defensor. Nacional's supporters look forward to another derby game next round, where their team will face at home their local rival from Montevideo Verdirrojo. Another interesting game was again a derby match of two local teams from Montevideo: Urunday Univ. (#3) and Malvin (#2). Urunday Univ. (16-6) won against visiting Malvin (17-6) 83-71. It was a key game for the top position in the league. Worth to mention a great performance of Emilio Taboada who helped to win the game recording 24 points and 4 assists. The best for the losing side was Nicolas Mazzarino with 17 points and 4 assists. Urunday Univ. keeps a position of league leader, which they share with Nacional. Defending champion Malvin keeps the second place with six games lost. Urunday Univ. 's supporters look forward to another derby game next round, where their team will travel locally in Montevideo to the arena Goes. Bottom-ranked Sayago managed to get a second victory, breaking the two-game losing streak. This time newly promoted Sayago edged thirteenth-ranked Verdirrojo in Montevideo 100-97. 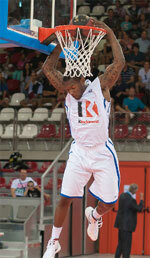 The winners were led by Calvin Warner who had that evening a double-double by scoring 36 points (!!! ), 24 rebounds and 5 assists. Newly promoted Sayago maintains fourteenth position with 2-21 record. Verdirrojo lost tenth consecutive game. Verdirrojo at the other side, also newcomer in the league, keeps the thirteenth place with 20 games lost. Sayago's next round opponent will be higher ranked Atenas (#11) in Montevideo and it may be quite challenging game. Another interesting game was also this time a derby match between local teams from Montevideo: Trouville (#6) and Bigua (#10). Bigua was defeated at home 73-80 and even the advantage of their own court did not help. It ended at the same time the two-game winning streak of Bigua. The best player for the winners was Paul Harrison who had a double-double by scoring 17 points and 10 rebounds. Trouville's coach Alvaro Tito used a ten-player rotation which allowed the starters a little rest for the next games. Trouville (14-9) have an impressive five-game winning streak. They maintain sixth position. Loser Bigua keeps the tenth place with 13 games lost. Trouville's supporters look forward to an exciting derby game next round, where their team will travel locally in Montevideo to the arena Aguada. In the last game of round 24 Goes were defeated by Defensor in Montevideo 119-113. The most interesting game was a derby match between two local teams from Montevideo: Malvin (#2) and Aguada (#5). Aguada was defeated at home 89-98 and even the fact of playing on their own court did not help. It ended at the same time the five-game winning streak of Aguada. Malvin shot 62.1 percent from the field. They shot the lights out from three sinking 13 long-distance shots on high 54.2 percentage. Malvin looked well-organized offensively handing out 27 assists. The best player for the winners was naturalized Brazilian center Hatila Passos (211-85, college: N.Mexico St.) who had a double-double by scoring 18 points and 10 rebounds (on 8-of-10 shooting from the field). Point guard Marcos Cabot (178-89) chipped in 16 points and 6 assists. At the other side the best for losing team was American forward Dwayne Davis (196-89, college: S.Mississippi, agency: Interperformances) who recorded 30 points, 6 rebounds and 5 assists and his fellow American import center Ricardo Glenn (203-90, college: USC Upstate, agency: HMS) added 12 points and 7 rebounds respectively. Five Malvin and four Aguada players scored in double figures. Defending champion maintains second position with 17-6 record having just one victory less than leader Nacional. Aguada at the other side keeps the fifth place with eight games lost. Malvin's supporters look forward to another derby game next round, where their team will face at home their local rival from Montevideo Olimpia. Another interesting game was also this time a derby match between local teams from Montevideo: Trouville (#6) and Bigua (#10). Bigua was defeated at home 73-80 and even the advantage of their own court did not help. It ended at the same time the two-game winning streak of Bigua. The best player for the winners was American center Paul Harrison (203-89, college: N.Greenville) who had a double-double by scoring 17 points and 10 rebounds. Forward Miguel Barriola (191-90) chipped in 20 points. Four Trouville players scored in double figures. Trouville's coach Alvaro Tito used a ten-player rotation which allowed the starters a little rest for the next games. At the other side the best for losing team was American Storm Warren (201-88, college: LSU) who recorded a double-double by scoring 23 points and 12 rebounds and guard Martin Osimani (194-81, college: Duquesne, agency: Pro Sports) added 13 points and 8 assists respectively. Trouville (14-9) have an impressive five-game winning streak. They maintain sixth position. Loser Bigua keeps the tenth place with 13 games lost. Trouville's supporters look forward to an exciting derby game next round, where their team will travel locally in Montevideo to the arena Aguada. The game between closely ranked teams ended with 9th ranked Goes' (12-11) road loss to eighth ranked Defensor (15-8) 113-119 on Friday. Strangely Goes outrebounded Defensor 46-33 including 19 on the offensive glass. They looked well-organized offensively handing out 22 assists. Goes were plagued by 32 personal fouls down the stretch. The best player for the winners was American center Anthony-Laveal Johnson (203-88, college: Fairfield) who had a double-double by scoring 23 points and 10 rebounds. The other American import point guard Derwin Kitchen (191-86, college: Florida St.) chipped in a double-double by scoring 17 points and 11 assists. At the other side the best for losing team was guard Fernando Martinez (170-79, agency: Pro Sports) who recorded 27 points, 7 rebounds and 7 assists and American forward Rick Jackson (206-89, college: Syracuse) added 20 points, 16 rebounds and 4 assists respectively. Five Defensor and four Goes players scored in double figures. Goes' coach rotated eleven players in this game, but that didn't help. Defensor moved-up to fourth place, which they share with Olimpia. Goes lost fourth consecutive game. They keep the ninth position with 11 games lost. Defensor's supporters look forward to an exciting derby game next round, where their team will travel locally in Montevideo to the arena Atletico Welcome. Another interesting game was again a derby between two teams from Montevideo: Nacional (#1) and Olimpia (#4). Olimpia was defeated at home 82-92 and even the advantage of their own court did not help. It ended at the same time the three-game winning streak of Olimpia. It was a great shooting night for Nacional especially from behind the arc, where they had solid 53.3 percentage. Their players were unselfish on offense dishing 25 assists. It was a good game for naturalized Spanish center Esteban Batista (208-83, agency: Duran International) who led his team to a victory with 20 points and 9 rebounds. American John DeGroat (201-85, college: Pittsburgh) contributed with 21 points and 6 rebounds for the winners. American Brandon Nazione (202-94, college: E.Michigan) replied with 25 points and 7 rebounds and naturalized German center Kiril Wachsmann (203-84, college: Iona) added 10 points and 14 rebounds in the effort for Olimpia. Both teams had four players each who scored in double figures. Nacional have a solid three-game winning streak. They maintain first position with 16-6 record, which they share with Urunday Univ. Olimpia at the other side keeps the fourth place with eight games lost. They share the position with Defensor. Nacional's supporters look forward to another derby game next round, where their team will face at home their local rival from Montevideo Verdirrojo. Bottom-ranked Sayago managed to get a second victory, breaking the two-game losing streak. This time newly promoted Sayago edged thirteenth-ranked Verdirrojo in Montevideo 100-97. Sayago dominated down low during the game scoring 74 of its points in the paint compared to Verdirrojo's 48. They outrebounded Verdirrojo 63-44 including a 21-9 advantage in offensive rebounds. Sayago players were unselfish on offense dishing 25 assists. The winners were led by American forward Calvin Warner (201-80, college: Jacksonville) who had that evening a double-double by scoring 36 points (!!! ), 24 rebounds and 5 assists and the other American import forward Duke Crews (203-88, college: Bowie St.) supported him with 29 points and 12 rebounds. Even a double-double of 13 points, 9 rebounds and 16 assists by guard J Mayora (180-95) did not help to save the game for Verdirrojo. Center Rogelio De-Leon (205-89) added 24 points and 7 rebounds. Four Sayago and five Verdirrojo players scored in double figures. Newly promoted Sayago maintains fourteenth position with 2-21 record. Verdirrojo lost tenth consecutive game. Verdirrojo at the other side, also newcomer in the league, keeps the thirteenth place with 20 games lost. Sayago's next round opponent will be higher ranked Atenas (#11) in Montevideo and it may be quite challenging game. Another interesting game was again a derby match of two local teams from Montevideo: Urunday Univ. (#3) and Malvin (#2). Urunday Univ. (16-6) won against visiting Malvin (17-6) 83-71. It was a key game for the top position in the league. Worth to mention a great performance of Emilio Taboada (191-82, agency: Pro Sports) who helped to win the game recording 24 points and 4 assists and American Quinnel Brown (198-83, college: Auburn) who added 23 points during the contest. The best for the losing side was naturalized Italian guard Nicolas Mazzarino (184-75) with 17 points and 4 assists and naturalized Brazilian center Hatila Passos (211-85, college: N.Mexico St.) scored 4 points and 11 rebounds. Urunday Univ. keeps a position of league leader, which they share with Nacional. Defending champion Malvin keeps the second place with six games lost. Urunday Univ. 's supporters look forward to another derby game next round, where their team will travel locally in Montevideo to the arena Goes.